Being something of a shy girl, you’d think that airports would overwhelm me the same way that theme parks and state fairs do. 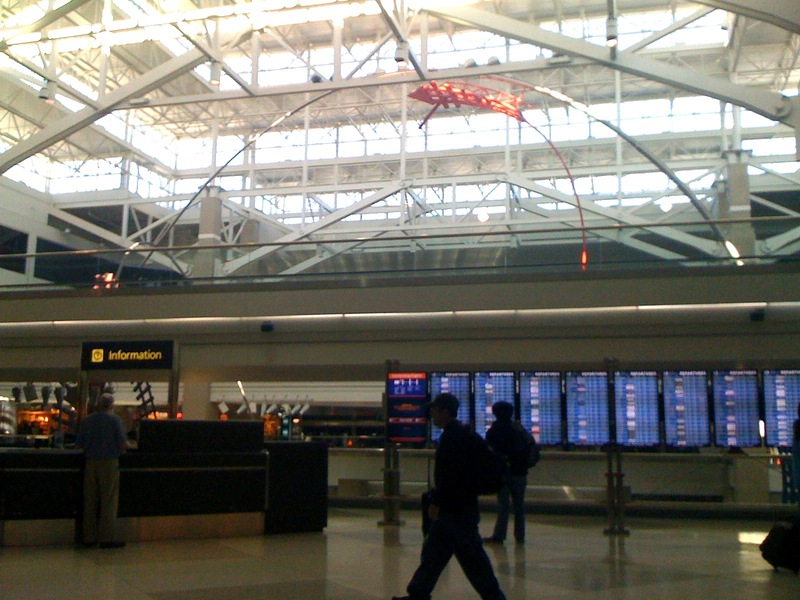 But airports are some of my favorite places, especially the teeny tiny local ones and the big international ones. They’re a writer’s dream: basically a full cast of characters to pick and choose from. Look at the makeup of the crowds waiting at each gate. Study the general differences between gates and imagine what that says about the place. For example: On my recent flight, there was a disproportionately high presence of camo and hunting boots at the gate to Akron, OH. Watch. Airports are emotional places. People say goodbye, part ways, start new lives, reunite with old friends. Watch those stories unfold, and make sure to record as much detail as possible. Eavesdrop. People don’t really read anymore when they’re waiting for a flight; they talk on their phone. Oftentimes, they talk about the trip from which they’re returning (or on which they are embarking). On my flight back to Colorado, a group of six black women with leopard-print luggage, obviously close friends, were discussing their friend’s son who had either a) committed suicide or b) been institutionalized (couldn’t quite figure out which). Apparently this kid’s dad had experienced similar problems, and they wondered if it was genetic; mostly, they talked about how their friend (the mother) should have dealt with the situation, and how she should deal with it now. Use your flight to write. It’s the ideal setup for a writer: no internet for distractions, a handy tray that doubles as a desk, and snacks served right to you. 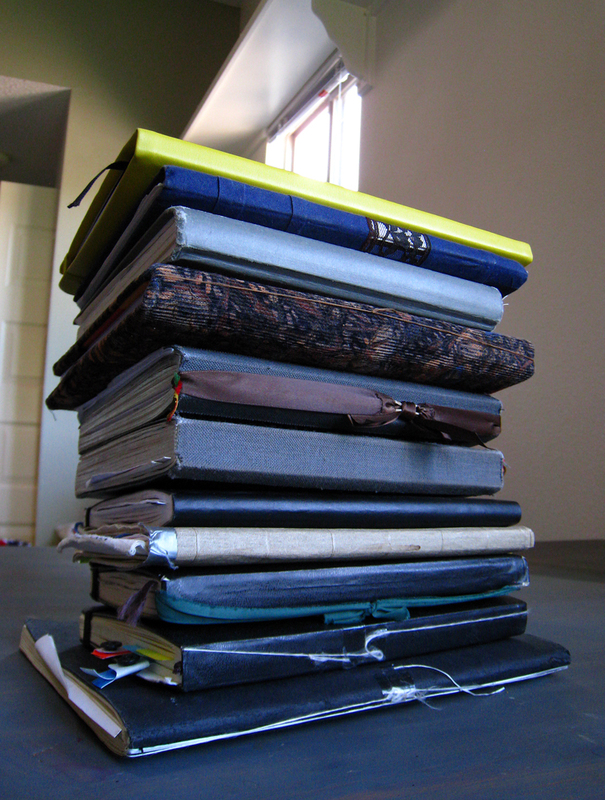 My senior year of high school, I carried a moleskine notebook with me at all times. I was slowly (and painfully) detaching myself from high school, and I didn’t speak much that year– everything went into the book. It was sort of a compulsion, really: I had this tiny, meticulous handwriting, and I wrote in complete, cohesive sentences, often in essay-style. I copied down every quote that was meaningful to me, every conversation I overheard, nearly every unique thought that passed through my mind. And I neatly pasted in every receipt, ticket stub, every scrap of paper that I came across. My doodles were always photo-realistic, never imaginative. Looking back on it now, I see that year as a process of collecting the disparate scraps of myself before leaving for college. So then, the turning point: I went to see a film with my dad, and my bag was stolen from under my seat. With my journal in it. …and I learned the very important lesson, that you should always keep yourself whole enough to survive a stolen book. I think my mistake was trying to make it honest and beautiful at the same time. I remember writing down horribly secret things that I had never spoken or written before: mortified, and brutally protective of the book afterwards. That honesty was necessary, but I had to set a lot of very restrictive boundaries for writing at the time: I only wrote in pencil, because I didn’t want to see any crossed-out mistakes. I would erase and re-erase until I had accurately articulated the feeling, event or thought that I wanted to convey. If I forgot to paste a ticket stub in, I felt furious– like something was missing and the book was incomplete. And I never allowed myself to go back and read my earlier writing. After that book was stolen, I didn’t journal for my entire first year at college. It was too painful, and I was exhausted. I didn’t have the energy to put my life together so compactly again. As it turns out, that painful transition was a Seriously Great Thing. For the first time in my life, I really embraced the place that I was in (which is to say, college). I explored it. I introduced myself to people, I put myself out there, I took risks. I cut my hair off. I got straight A’s, fell in love, twice, and began to see myself better, and more clearly. Basically, I put my energy into my life instead. But let’s face it, I’m a creative writing major: I need some paper in my life. I transferred schools, feeling infinitely grateful to my first college and peaceful about leaving it. This time, when I returned to the habit of writing things down, I began using a pen. Which meant I crossed things out, a lot, and my handwriting was larger and looser. I also discovered how inferior moleskine paper is. I can’t say that my three years of living at Kenyon were more meaningful than my first year at Hollins. But I can say that (slowly and consciously) I began to integrate writing into my life in a healthy way– a way that I could see playing into my future and my profession. And shucks, it does feel nice to look at that stack of notebooks and know that my tumultuous, rewarding college career is messily contained within it. I Am Officially A Paid Writer! I suppose I can officially call myself a Professional Writer now. 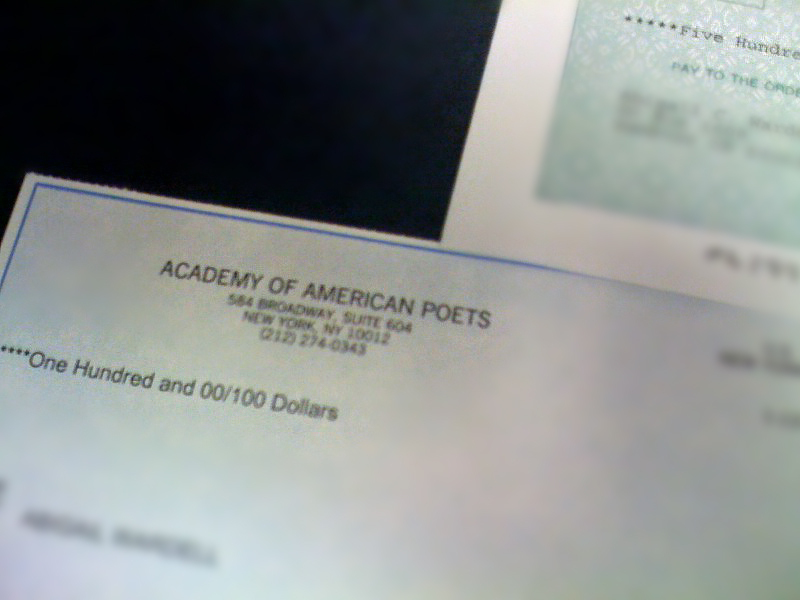 The top check is for the George B. Ogden prize for best essay in English prose, and the bottom check is for the Academy of American Poetry Prize. So, if my blog entries have been lacking text lately, it’s because I’ve been channeling it elsewhere! My thesis is due Monday (eep!) and I’ve basically set aside my social life for the past two weeks to really hone this piece. It’s particularly hard doing a creative thesis– it takes a lot of discipline to keep working on something even when I’m not feeling particularly inspired. But on the subject of books and literature… I wanted to link to this excellent article from The Non-Consumer Advocate about the Amazon Kindle versus old-fashioned books. I’ve tried to be pragmatic about technology (getting an iphone was an angst-inducing decision for me) but I think I must side with the article on this one. Books aren’t environmentally perfect, but they’re a much better alternative than the Kindle, which has a massive carbon footprint and a short life span. This has certainly been the case with the ipod– or, well, with almost any product, really. This is a great example of the way that corporations exploit gender in order to maximize their profit. And, of course, causing massive environmental waste in the process. Link for the day: Society for Literary Excellence – an excellent example of the ways that analog living adapts to a digital world. My senior thesis as a creative writing major is centered around a similar theme. I go to school in the middle of Amish country, cornfields, and apple trees. I’m saturated with the quirks and the brilliance of rurality, and at the same time, the sadness of rurality: the superficial attempts to imitate urban culture, the sense of cultural inferiority, the rude ways that city students treat the locals. It’s complex. I like working it into words. I’m in the middle of writing a shorter essay about this topic, so look for that post in the coming weeks.